Note: Bold type indicates measuring rim. Here's a tire with a drag slick surface and a newly designed rib configuration, which allows them to be D.O.T. approved. Perfect drag racing slicks for the weekend warrior! Warning: DOT labeled Hoosier Racing Tires meet Department of Transportation requirements for marking and performance only and are NOT INTENTED FOR HIGHWAY USE. 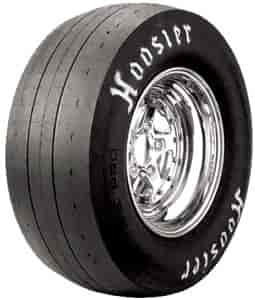 It is unsafe to operate any Hoosier Racing Tire including DOT tires on public roads. The prohibited use of Hoosier Racing Tires on public roadways may result in loss of traction, unexpected loss of vehicle control, or sudden loss of tire pressure, resulting in a vehicle crash and possible SERIOUS PERSONAL INJURY OR DEATH. JEGS 65000 - Tire Cover with Suction Cups 44" x 35"
Hoosier 288610015 - Drag Tube Tread: 11" to 13"